Topps Inc., makers of the best-selling MLB� SportsClix� collectible miniatures game (CMG), is proud to announce the all-new 2005 MLB� SportsClix releasing March 30th. The game is produced by WizKids Inc., a subsidiary of Topps. The all-new game plays faster, with everything two people need to get into the dugout packaged in one low-priced Starter Set. Booster Packs expand collections with rare Hall of Fame players like Lou Gehrig and Babe Ruth, and they also include the elusive Master Piece Babe Ruth Red Sox figure (one recently auctioned on eBay for $1,300, which benefited the Boys and Girls Club of America). 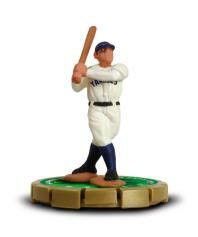 It features real major leaguers sculpted as two-inch-high 3-D game pieces. MLB SportsClix gamers act as team managers, collecting and trading the miniature players to face each other on a ballpark playmat. MLB SportsClix simulates real game situations by using specially-designed dice together with actual statistics that are contained in each player-specific figurine. The Alex Rodriguez figure, for example, will be a more powerful player in the SportsClix world just as he is in real life. And Randy Johnson will be an intimidating presence on the mound. Starter Sets (SRP $9.99) contain four pre-selected figures, enough tokens to fill a dugout, complete rules, special dice, a playmat and a collector's list. Booster Packs (SRP $4.99) contain two randomly selected figures. Learn more about MLB� SportsClix online at http://www.wizkidsgames.com/sportsclix/mlb.